Bikini Boot Camp was created by Melissa Perlman and Erica Gragg who are founders of the Amansala Spa in Mexico; a favorite wellbeing retreat of supermodels and celebrities including Sienna Miller, Cindy Crawford and Linda Evangelista. The creators of the program say that you can lose 4 to 10 pounds and achieve the bikini body you want in two weeks. It is a comprehensive program including healthy eating, exercise, meditation and motivation techniques. Although the term ‘boot camp’ creates visions of army style relentless workouts, Erica claims that the program won’t leave you feeling completely exhausted. The combination of healthy eating, exercise and addressing psychological aspects is designed to help energize you. The phrase ‘boot camp’ refers more to the attitude of self-discipline and resolve. 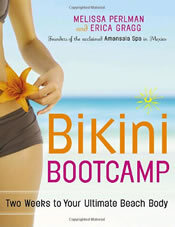 Bikini Boot Camp guides readers so that is possible to create the spa program experience in their own homes. In addition to recommendations for healthy eating, exercise and relaxation techniques readers are also provided with instructions for spa treatment rewards at the end of the day with recipes provided for facials, cleansing beauty treatments and herbal baths such as ‘Oatmeal Rose Skin Restoring Bath’ and ‘Cooling Cucumber & Honey Scalp Treatment’. The creators of Bikini Boot Camp don’t like to call their program a diet but instead regard it as a total lifestyle plan. Their philosophy is ‘moderation not deprivation’. Although the program is designed as a two week intensive overhaul the idea is that the fast results achieved, combined with the changes in emotional and psychological outlook, will result in an increase in motivation that will lead to a permanent healthy lifestyle. The program can be repeated to increase results. Book includes lifestyle plan to follow at the conclusion of the initial 2 week program. Never skip breakfast as this meal is essential to keep metabolism working. Participants are advised to eat fruit with yogurt, granola and/or eggs. Always eat when hungry. Choose snacks from the approved list and monitor portion sizes. Eat slowly with awareness and chew food thoroughly to improve digestion so you get more nourishment out of your food. Go easy on yourself. Failure should not be in your vocabulary. Realize that the process is ongoing and simply begin again at your next meal if you deviate from the plan. Includes lean proteins like fish and chicken breast, high fiber carbohydrates such as whole grains, beans, fruit and vegetables as well as healthy fats. Other low calorie recipes can be found here. The book outlines a complete fitness regime with detailed explanations and illustrations. Bikini Boot Camp retails for $17.95 US. Balanced approach with equal emphasis on diet, exercise and psychological factors. Good for people who want to get a fresh start on a healthy lifestyle. Very demanding. Time required for exercise is at least 2 hours every day. Meal preparation may also be time consuming. It is unrealistic for dieters to expect to achieve their goals in two weeks especially given the wide range of weight that individuals may wish to lose. However if you can look beyond the claims that you will achieve your ideal body in two weeks this is actually a very balanced plan for longer term weight loss. This is also a very demanding program in terms of the time investment for exercise and food preparation however those who dedicate themselves to this plan will most likely achieve good results in a relatively short time while also creating positive lifestyle changes that will benefit health. AFTER A MONTH OF EATING THIS DIET AND EATING ASIAN CHICKEN LETTUCE WRAP I GAIN 300 LBS. AND BECOME ASIAN! this diet seems kinda weird… and i don’t think that it will work… i want to be in a bikini but… i don’t think this diet will get me there!!!!!!!! Why don’t they make diets for picky eaters? I’m not horribly picky but I don’t like a lot of things. from the comments i just read, it seems the bikini boot camp diet works.Therefore I will try it and see how it will work for me. Eek, this diet looks too hard to maintain! this may be to hard i think you should start off slow and progress. the only propper and effective way to loose weight is the old fashioned way. Fruits, veggies, few carbs and some excercies. everything else is just a joke and a scam to get your money. does not make no sense, there diets are crap! This is essentially the diet I made up for myself, minus all the exercise. I created it for myself to lose weight gained from a steroidal injection I received for a torn disc. I’ve lost 10 pounds in 2 weeks without excercise, which would probably be triple that if my back weren’t preventing me from exercise. I recommend it highly. i lost a stone in 2 weeks, and i feel great its amazing!! !